Geese have become somewhat of a plague in the area were we live. There are so many of them that they ruin the fields and therefore their numbers need to be ‘managed’. As a result, local wild goose is now available. It is similar to duck breast, but it is sold without skin. And since it is wild rather than farmed, its flavor is a bit more ‘gamey’. When cooking red breast meat like this, it is very important not to overcook it. Medium rare it is tender, juicy and delicious. Overcooked it is tough, dry and has an unpleasant taste of iron. And so it can’t be a surprise I opted to cook the goose breast sous-vide, for 2 hours at 56C/133F. Start by dry curing the goose breast. Mix 1 Tbsp minced bay leaves, 1 1/2 tsp (11 grams) salt, 1/2 tsp sugar, 1 Tbsp fresh thyme leaves, 2 crushed cloves, 1/2 tsp minced juniper berries, and 1/2 tsp freshly ground black pepper. Rub the goose breasts with this mixture on all sides. 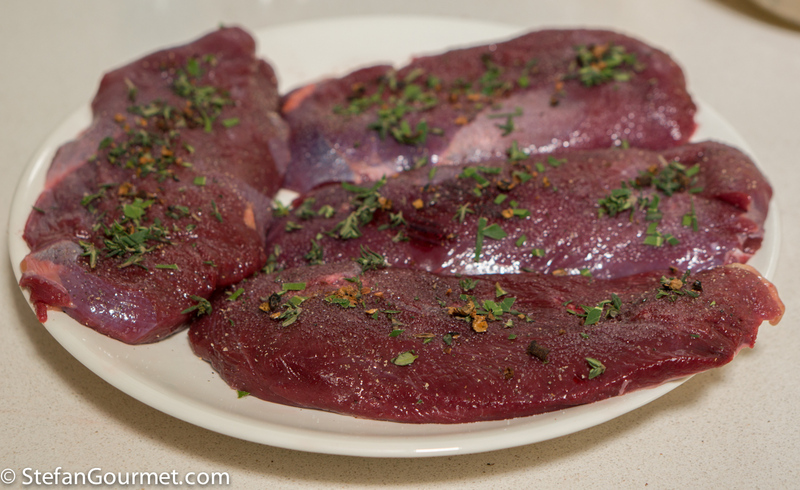 Vacuum seal the goose breasts and allow to cure for 6 to 10 hours in the refrigerator. 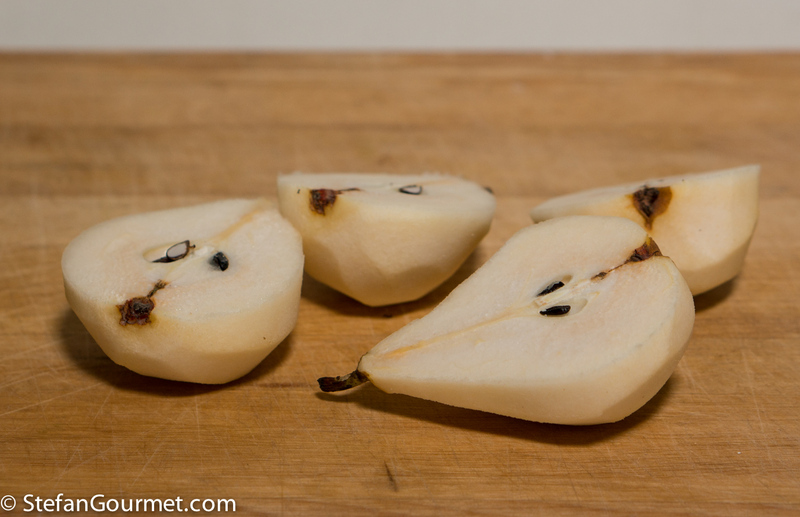 I opted to cook the pears sous-vide as well, because that way you need less wine and they keep their shape better. 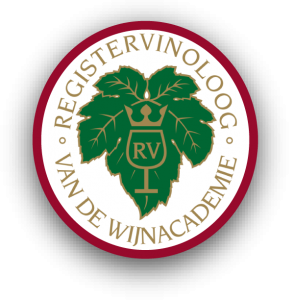 Because pears are cooked sous-vide at 85C/185F, which is above the boiling point of alcohol, the alcohol in the wine needs to evaporate before vacuum sealing the pears with the wine, as otherwise the alcohol would turn into gas, causing the bag to float. 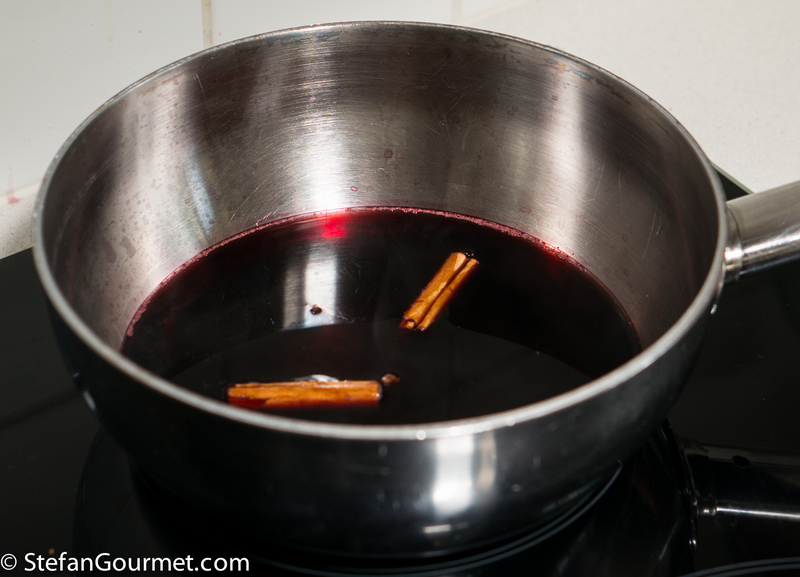 Pour 120 ml (1/2 cup) red wine into a saucepan and bring it to a boil. 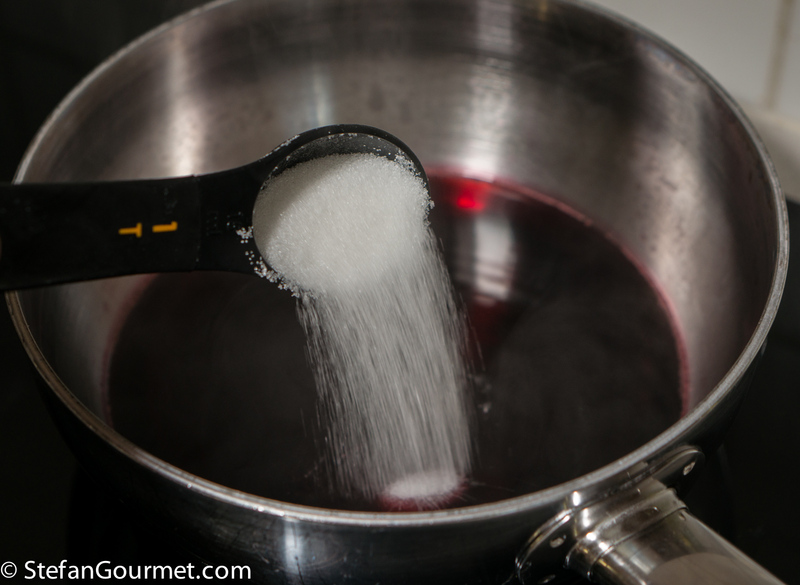 Add a tablespoon of sugar, and stir until it has dissolved. Add a stick of cinnamon and 2 cloves. Peel 2 pears and cut them into halves. 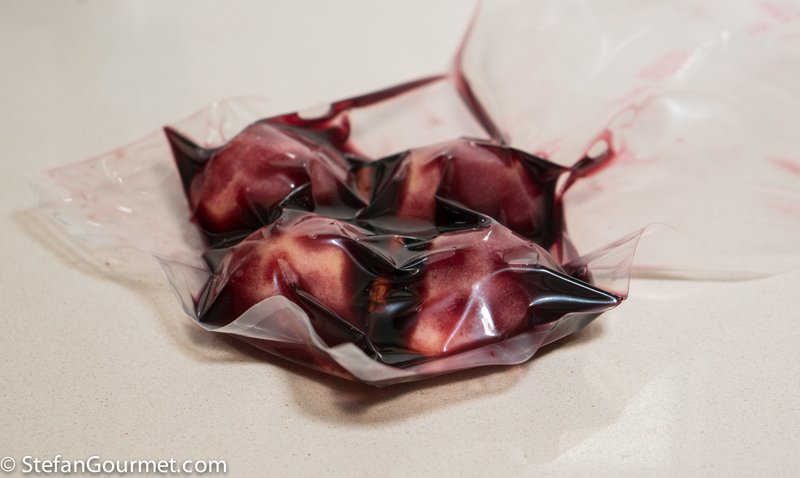 Vacuum seal the pears with the spiced wine. 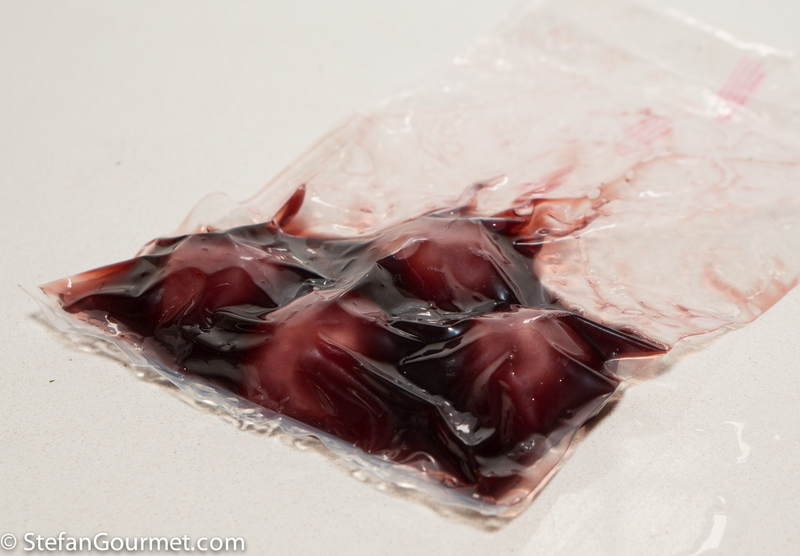 You can do this with a ziplock bag and the water displacement method, or in a chamber vacuum sealer. 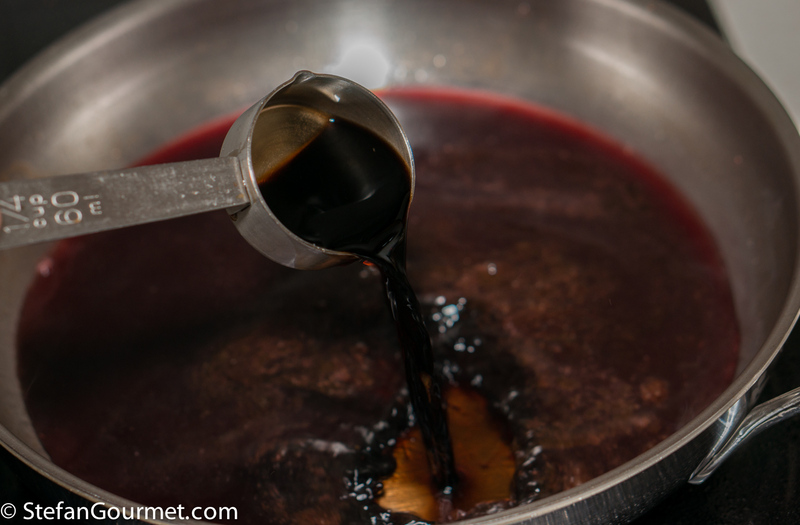 For the latter, the wine needs to be cooled off before vacuum sealing as otherwise it will start to boil at the low pressure. Cook the pears sous-vide at 85C/185F for 45 to 90 minutes, depending on the type of pears (cooking pears will require 90 minutes, while 45 is enough for pears you could eat raw as well). 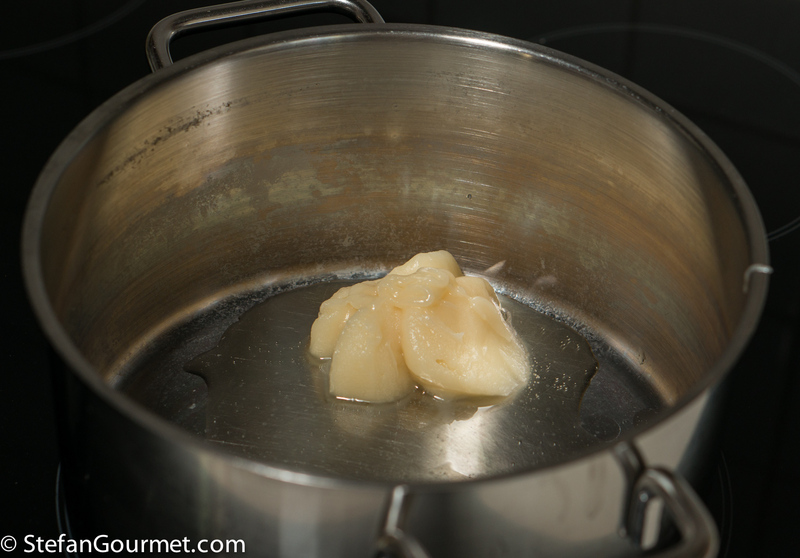 If you own only one sous-vide device, you can keep the pears warm or reheat them together with the goose at 56C/133F. 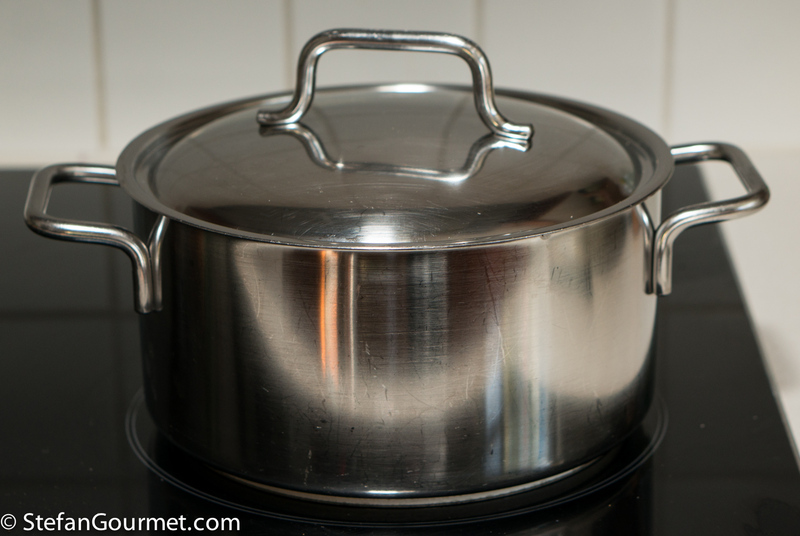 For the sauerkraut, start by melting 2 tablespoons of goose fat (or duck fat) in a saucepan. 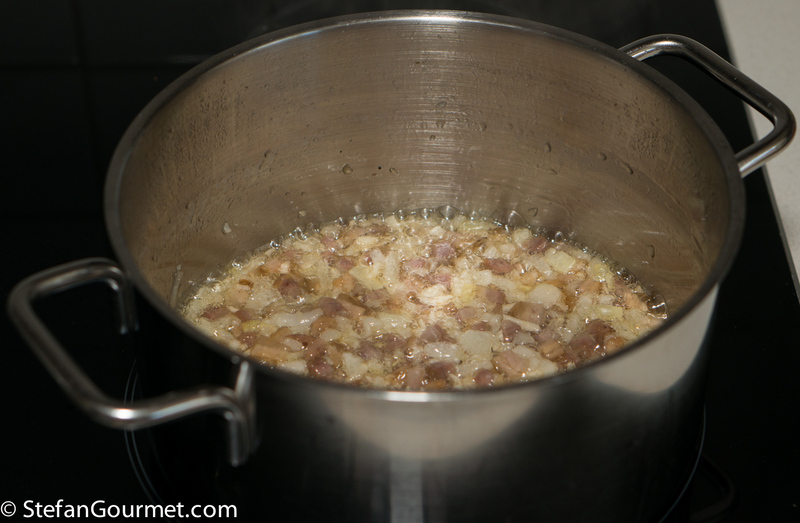 Add a small minced onion and cook until soft and fragrant, about 5 minutes. 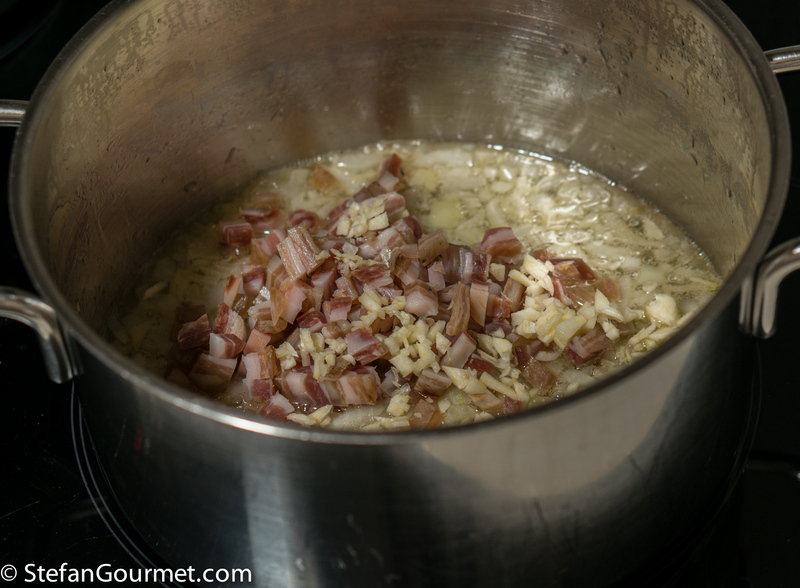 Add 60 grams (2 oz) of diced pancetta or bacon (small dice) and 2 minced cloves of garlic. 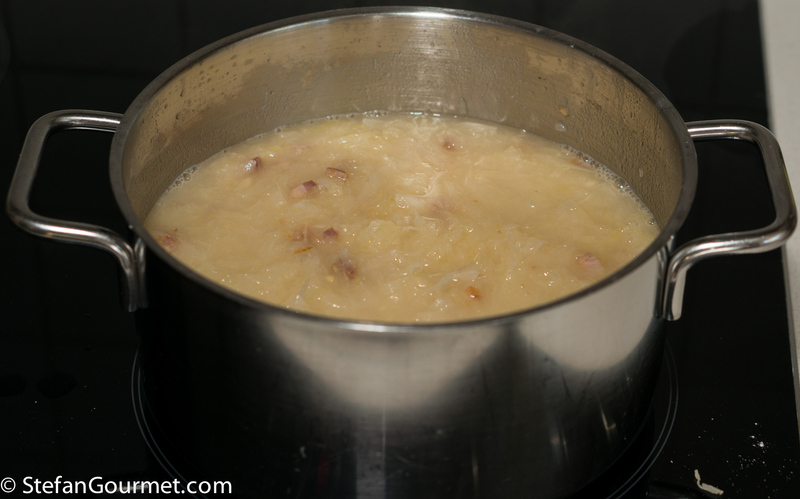 Cook briefly until the pancetta starts to color. Do not allow the garlic to brown. Add 2 tablespoons of flour. Stir for a minute. 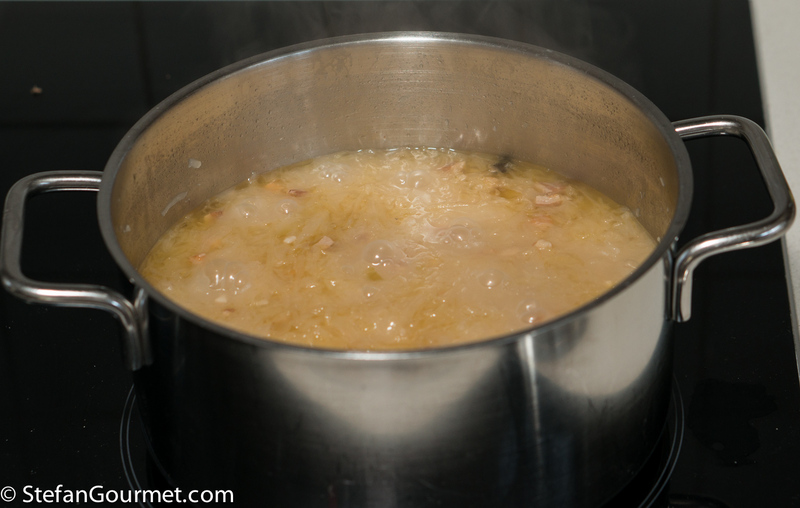 Add 500 grams (1.1 lb) sauerkraut and enough vegetable or chicken stock to barely cover the sauerkraut. Add 2 bay leaves and 1/2 tsp of juniber berries. 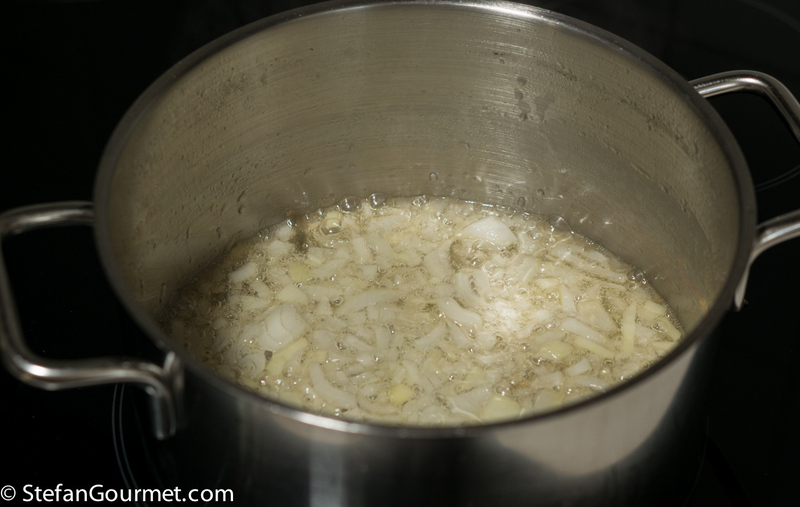 Bring to a boil, then reduce to a simmer and simmer for 90 minutes, stirring now and then. 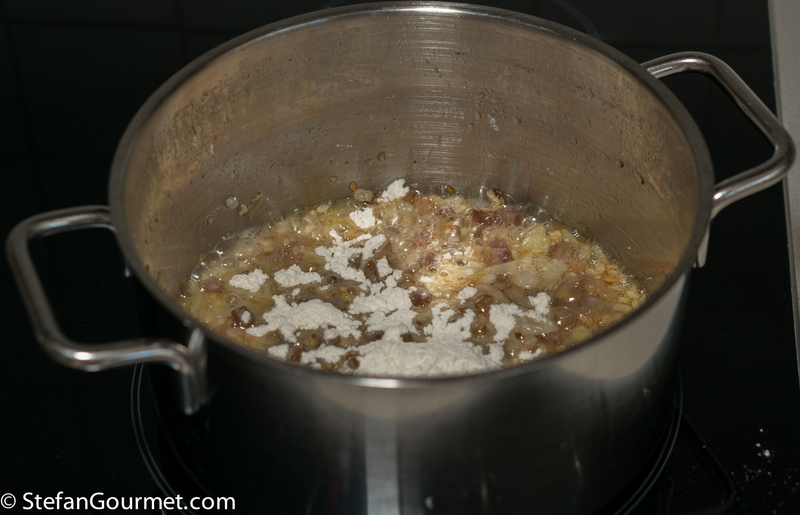 When the sauerkraut is tender, taste and adjust the seasoning with salt and freshly ground black pepper. Take the goose breast out of the refrigerator once it has finished curing. 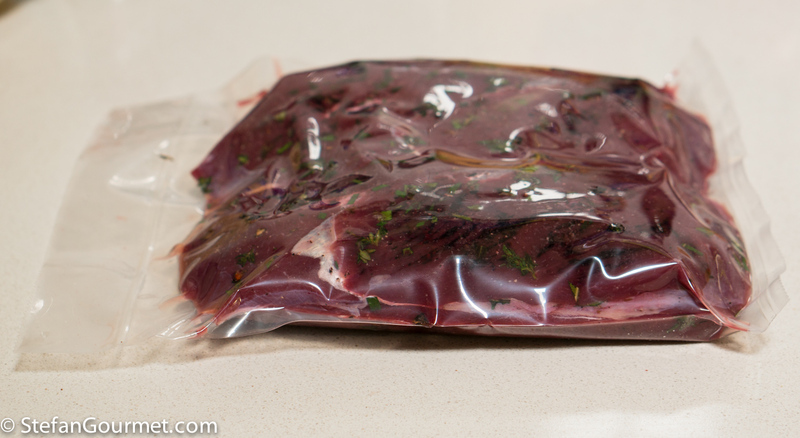 Take the meat out of the bag and rinse well with cold running water, rubbing to remove the curing mix. Vacuum seal individually, or at least in a single layer. Cook sous-vide for 2 hours at 56C/133F. 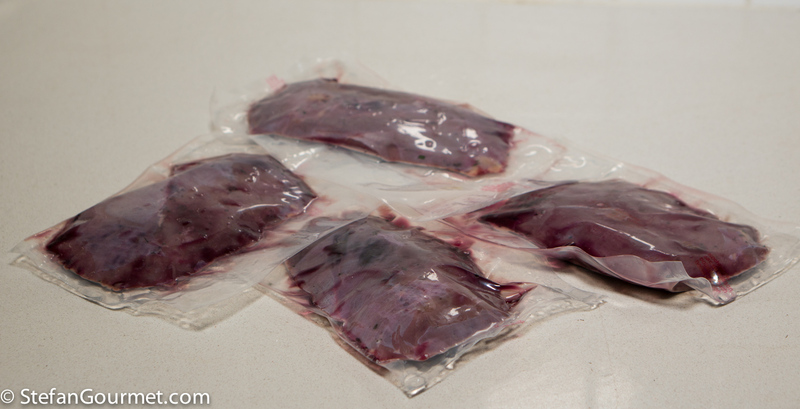 When you are ready to serve, take the goose breasts out of the sous-vide bag and pat dry with paper towels. 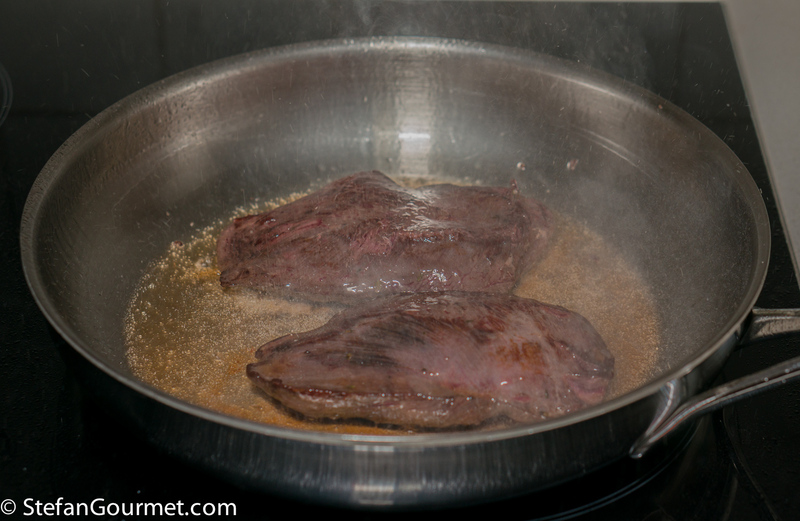 Brown the goose breasts quickly in goose fat (or duck fat) over very high heat. Once they are browned on both sides, wrap them in aluminum foil to keep them warm while you finish the sauce. 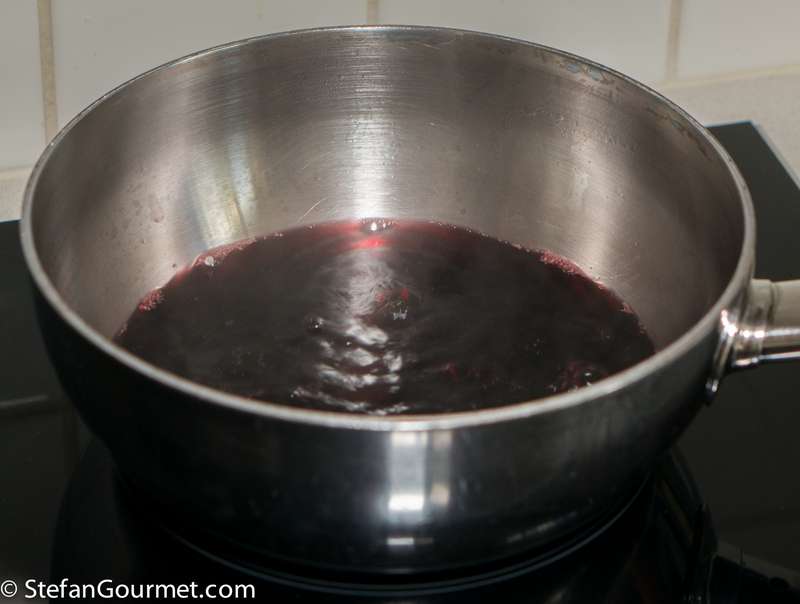 Deglaze the pan with 240 ml (1 cup) red wine. 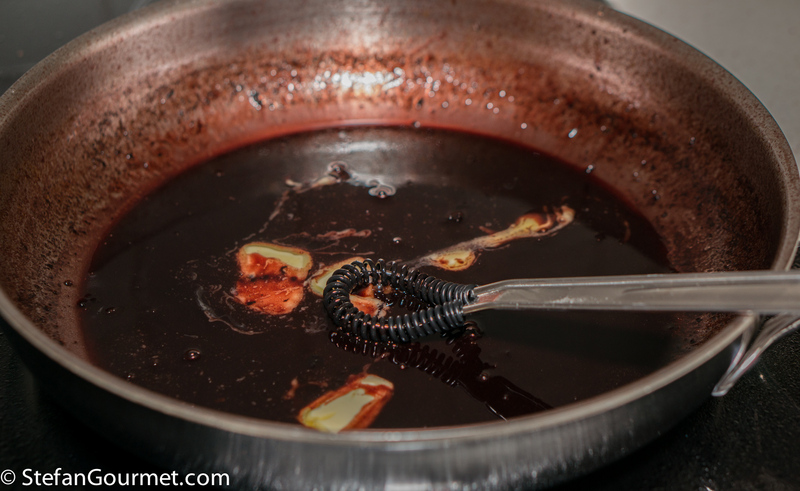 Add 60 ml (1/4 cup) balsamic vinegar. 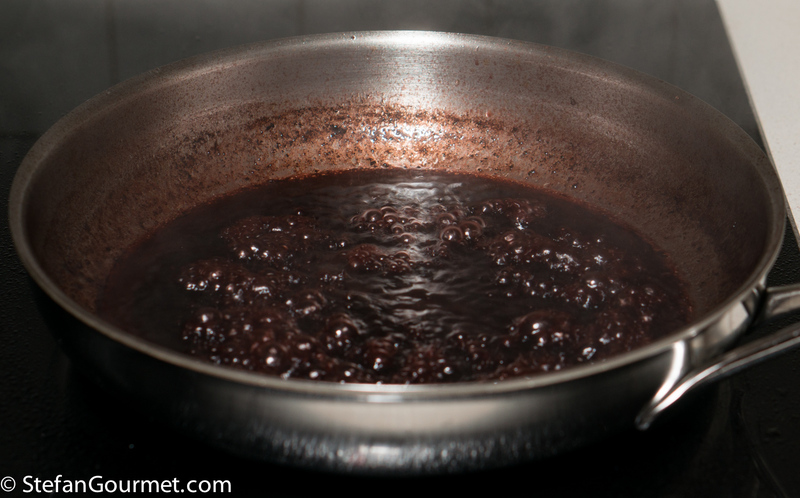 Reduce over medium high heat until you have about 120 ml (1/2 cup) left. Turn off the heat and add a tablespoon of butter, cut into pieces. Whisk to incorporate the butter. Take the pears out of the bag. If you like it sweet, you could add the juices from that bag to the sauce (before adding the butter). I didn’t. 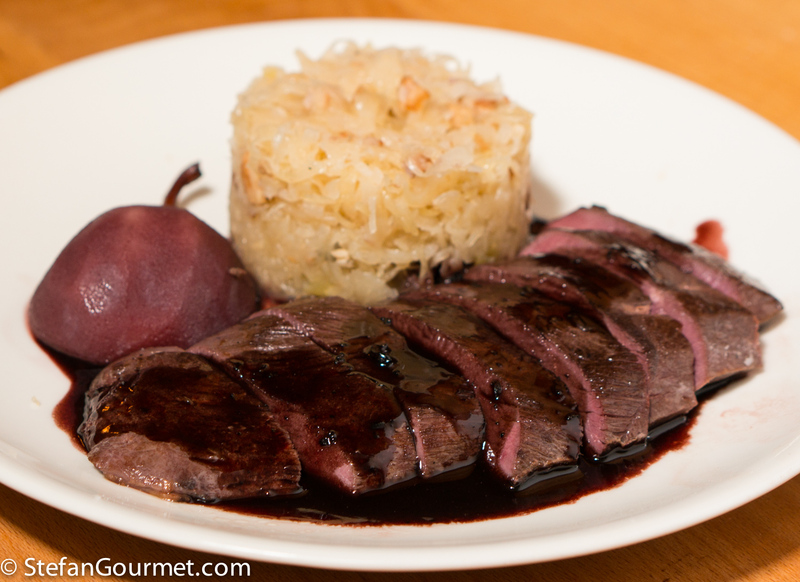 Slice the goose breast and serve on preheated plates with the sauerkraut, half a pear and the sauce. 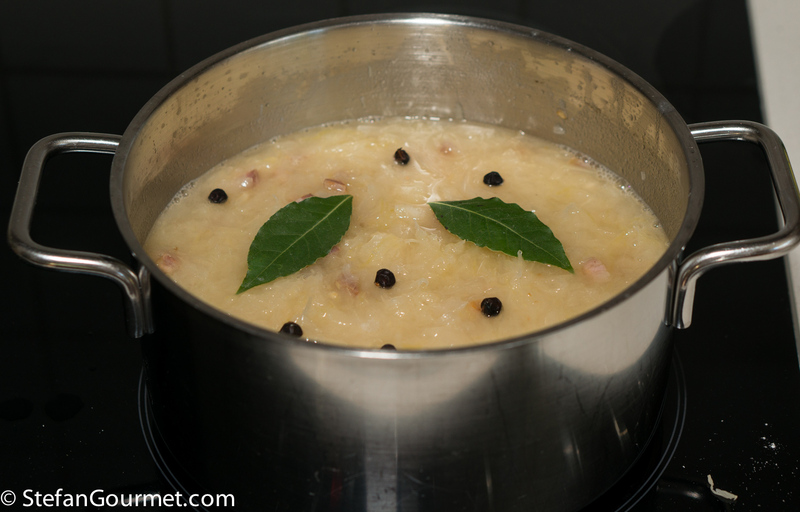 Remove the bay leaves from the sauerkraut before serving. We enjoyed this with a pinot noir from Alto Adige. A full-bodied pinot noir with good acidity from another region would also be a good choice. I think the fatty goose refers to the farmed variety — this one was very lean indeed. Man, you outdo yourself every post! You need a column in a newspaper or magazine. Really enjoying the level of difficulty and technique in each of your recipes. The last time I had goose was at the 30th anniversary of an organic grower’s cooperative I worked on in Le Marche, Italy. We had the wings baked and they were amazing. A total 180-degree turn from sous-vide style. Yours looks great too, though! Thanks. I wonder what they did with the rest of the birds if you only had the wings? Sous vide seems so interesting. I have never eaten anything cooked this way but very eager to try. It is quite likely you’ve already eaten something cooked sous-vide at a restaurant, because they often don’t mention that they do. 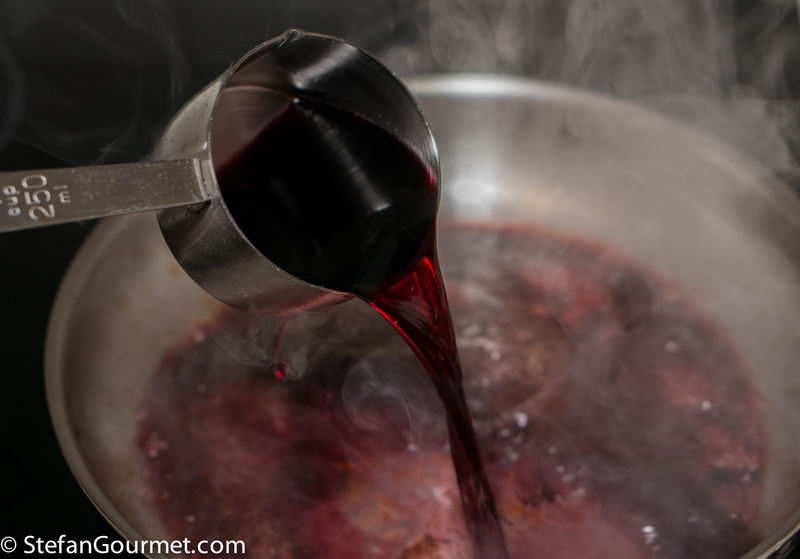 Especially high-end restaurants (or gourmet chefs at simpler restaurants) use sous-vide. We have an overrun of geese here too that don’t migrate. They’ve done everything from poisoning the eggs to hiring out dogs to shoo them off to just flat out killing them. The last kill they did went to the homeless shelter, I doubt they did it sous-vide though. 😦 :Ah well, I am sure yours was delicious. I very much doubt it, too. 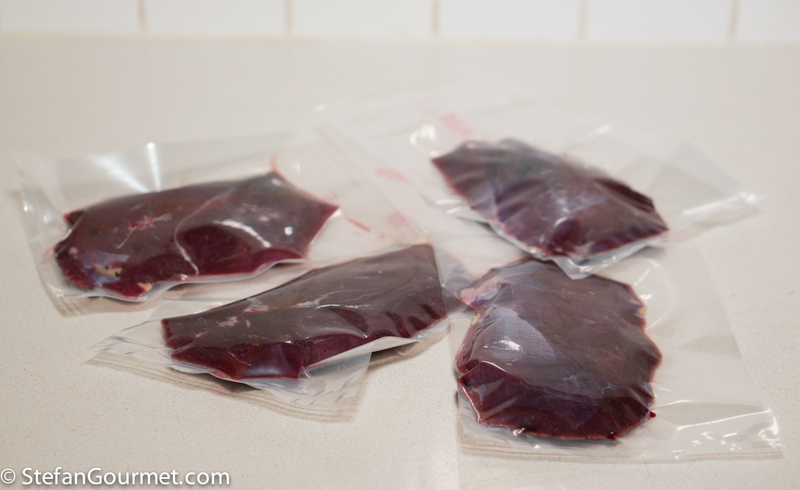 The problem with wild geese is that you need a bit of skill to cook them nicely — or sous-vide equipment. And so the prized meat ends up al the shelter and probably wasn’t cooked properly there, but I expect the homeless were happy anyway. The pear, red wine and sauerkraut sound like a nice combination! Are you allowed to shoot them in your yard? Why do you repack the geese breasts? To be very honest I am not completely sure whether that makes a big difference. I actually want to do some side-by-side experiments to find out. I’ve done it to separate the steps of curing and cooking. 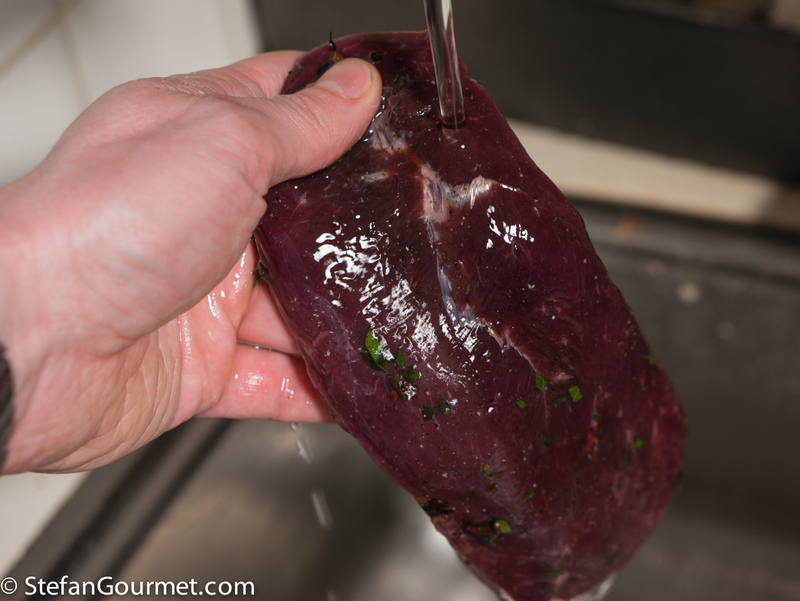 By rinsing the cure off the meat and repacking, you make sure the goose breast won’t become too salty. However, since I use a moderate amount of salt in the first place, perhaps that is not as big an issue. Some curing recipes use a lot of salt and depend on the timing to control the saltiness of the meat. In those cases, it would definitely make a difference. I assume the recipe could be followed with duck breast, in the event you don’t have access to goose? Looks amazing. Thanks, Shane. You could certainly use duck breast. 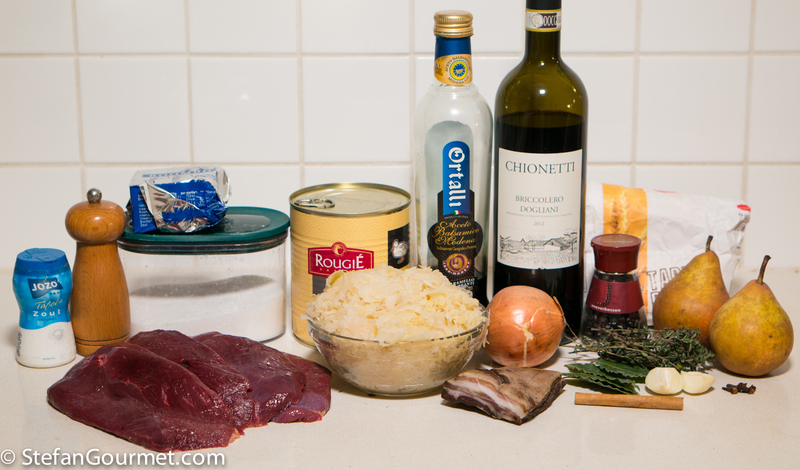 If it is farmed goose breast it will taste less ‘gamey’, but that may actually be an advantage. Duck breast usually comes with the skin. 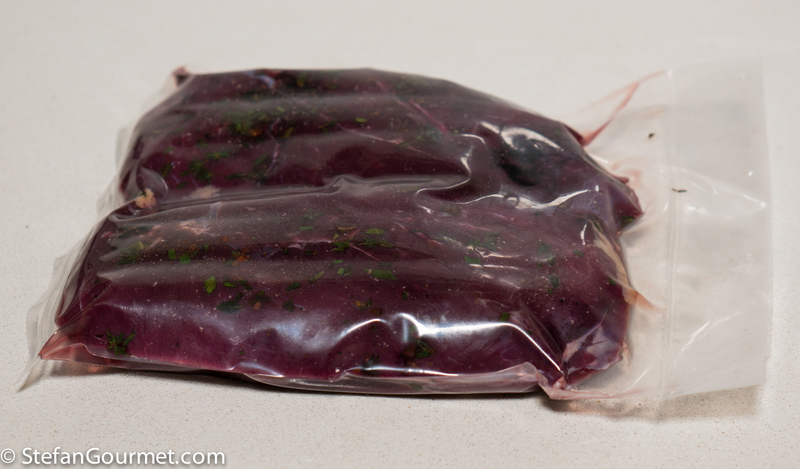 There are several posts on this blog about how to cook duck breast with skin sous-vide. Another beautiful and tantalizing dish, Stefan. You’re right. 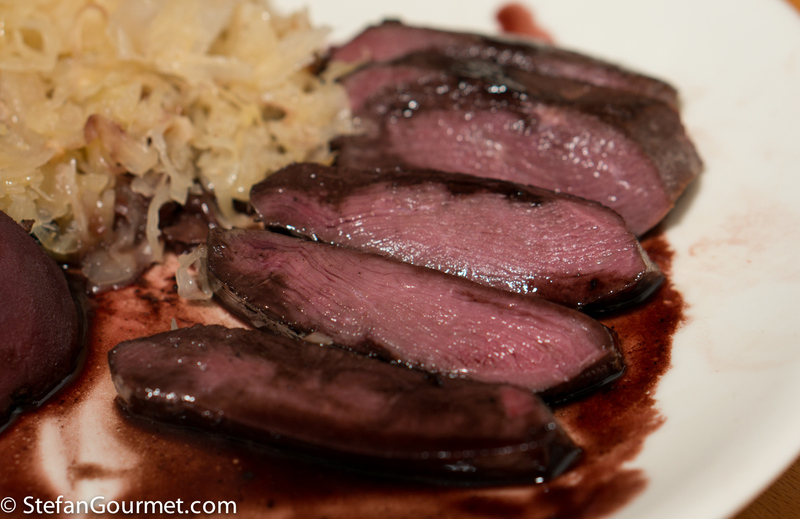 That goose is cooked perfectly and love that you paired it with sauerkraut. We, too, have a geese problem. Canada geese are protected and their numbers have really grown. They aren’t migrating as far as they once did and some areas are inundated. I think that a limited hunting season may be in the offing in the not too distant future.